This gorgeous 1943 family film stars Roddy McDowell as a Colorado rancher's son who takes a shine to a colt named Flicka and chooses to train her. The boy's father (Preston Foster) isn't happy about the idea: the horse is an offspring of a stormy mare who may not be right in the head. For a while, Flicka seems determined to prove the rancher's point, fiercely resisting young McDowell's efforts at domestication. 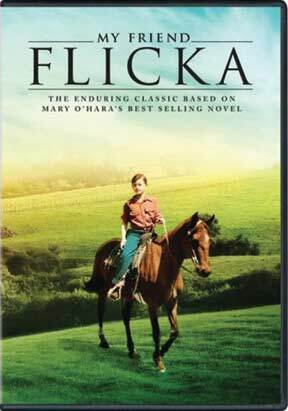 But persistence and love win the day, and Flicka grows up to be a magnificent animal and friend. The film was shot by director Harold Schuster and cinematographer Dewey Wrigley as if for the ages, marrying such perfect elements as a Technicolor sweep of the beautiful Rocky Mountains setting with a wonderful story, plus McDowell's charismatic earnestness. Based on the Mary O'Hara novel, this film was popular enough in its time to inspire a couple of sequels, though the original best stands up as a perennially worthy adventure tale for kids ages 5 and up.